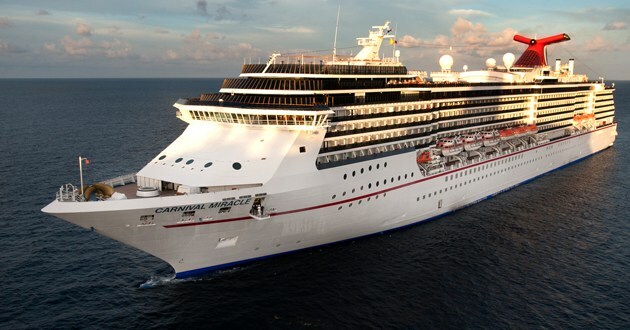 The Carnival Miracle currently sails 7 night cruises to the Western Caribbean from Tampa, Florida. On October 12, 2019, Miracle will begin sailing from the West Coast to the Mexican Riviera, Baja Mexico, and Hawaii. On January 28, 2010, upon berthing in Port Zante at 11:00 AM, a sudden gust of wind pushed the vessel starboard against the pier. The incident resulted in hitting one of the dolphins and one of the fenders there. Passenger disembarkation was done at Port Zante . Since the ship sustained hull damages, a Puerto Rican team of welders started patching works so the vessel to be allowed to depart from ST Kitts on the next day back to home port of Port Everglades, Florida. On July 7, 2008, the ship was running at lower than normal cruising speed due to a propulsion system malfunction. On this itinerary, call port Tortola was dropped and replaced with Grand Turk. This itinerary change remained until the dry dock repairs in early 2009. On December 23, 2008, while on an 8-day Western Caribbean cruise from home port Fort Lauderdale, the ship experienced propulsion issues. The incident resulted in reduced cruising speed and caused itinerary changes. The Costa Rica and Panama ports of call were dropped and replaced with Mexico and Honduras. Propulsion problems were fixed during the dry dock works , for which 3 cruises were cancelled. On April 18, 2014, a propulsion unit problem on the ship forced Carnival Cruise Lines to change the Alaskan itinerary. The problem affected the ship’s cruising speed. It was slowed from 21 kn to 18 knots. The Azipod unit was fixed during the dry dock refurbishment in 2015. The line provided all passengers canceling their Alaska cruises with full refund. On January 7, 2010, the ship was en-route to St Marteen when a male passenger sitting at the Maguire’s Bar, suddenly collapsed and died. Medical staff was unsuccessful in reviving him. The man had been previously on medication, suffering from cardiac arrhythmia. On January 19, 2010, after visiting the ship’s hospital, a male passenger went to its cabin and died in bed. His spouse tried CPR, then called the medical staff, but all efforts to revive him were unsuccessful. The investigation showed that death was result of medical problems previous to boarding the ship. On January 28, 2011, while the ship was en-route to Fort Lauderdale, Florida, from from Curacao, a male passenger was found by his wife lying unconscious in their stateroom’s bathroom. For about 20 minutes medical staff performed CPR, with no response. The dead passenger had a previous medical conditions and was on medications. On March 15, 2011, a 47-year-old male crew was reported missing and presumed fallen overboard. The accident occurred when the ship was in Southern Caribbean waters between Curacao and Aruba. The conducted search didn’t find the body. On March 18, 2016, a 47-year-old male passenger was found dead in his cabin. The ship was en-route from Cabo San Lucas, to Los Angeles, returning from a 7-day Mexican Riviera cruise. The next day the ship arrived in LA, and was boarded by FBI agents. Due to the investigation, passenger disembarkation was delayed by 90 minutes. On July 31, 2004, while the ship was en-route to home port NYC, New York, at 4:00 AM, an announcement was made via the PA system saying “This is the Captain speaking. All crew members abandon ship”. A few minutes later, via the PA system a female crew said that the previous message was a mistake. Later, the Captain apologized explaining that some teenagers made a prank accessing the PA system. On February 21, 2013, the Port Canaveral departure was delayed because of a bomb threat e-mailed to the port authorities. The cruise port was temporarily closed after the bomb threat was received at 5:00 PM. A safety zone was established and the whole port traffic was stopped. The ship was not allowed to board passengers or crew due to the vessel’s proximity to the Victory Casino Cruises boat. After conducting multiple searches and not founding any explosive devices, authorities re-opened the cruise port and the ship was cleared for embarkation.